I have been living with a vision for the better half of my life and I can say with confidence and humility that the many steps can only be made consciously when you have a story to guide them. I envy the ones who just live one day at the time and are not burdened by the itch of something they want to build or create over TIME. My VISUAL path has lead me across many different story lines by both individuals as well as organizations. They all seem to want to move…but are all looking for that light to follow. That story you want to be a part of. That general direction that gives focus to the clear goals you need to be running towards. What I am seeing a lot, and have been uncovering as a running theme within the work I do for others, is the movement of Change. We try to walk the line that moves between a present point A and a pre determined area B, which we generally fashion to look very appealing. We love to SEE a road or sequence of steps that help realize the milestones of the inbetween. 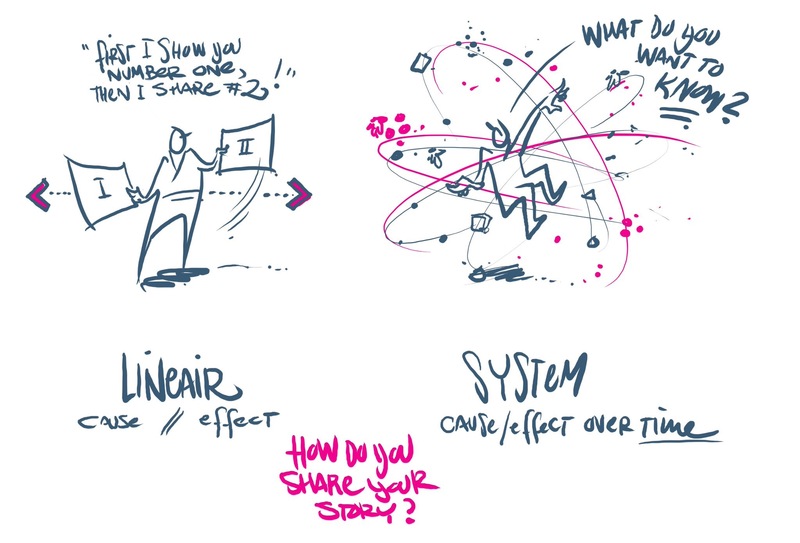 This sequence of planned steps between two points in time is how we have learned to tell and share stories. We start to tell the story by inviting your audience to a stage (your context) , describe the characters (or actors) and introduce a hero’s challenge. The quest is set. You can move up and down that storyline and make your past, present and possible future VISIBLE for all to see. Now here lies a challenge. In the land of storytelling we are exploring different ways to touch, move or inspire people. But alongside we are challenged by a multitude of tiny steps that are all part of a system. A structure that is getting more visible every day. We are living IN our own storylines… our Twitter and facebook feeds become a line that is influenced by so many different things, that it is almost impossible to be a good curator of your own STORY. Posted in Drawing out Change, experiment, story, Thinking. Bookmark the permalink. This reminds me of a weird Japanese game, where you don’t follow the game’s story chronologically. Instead you jump around to different decisions at different points in time to experience different consequences.